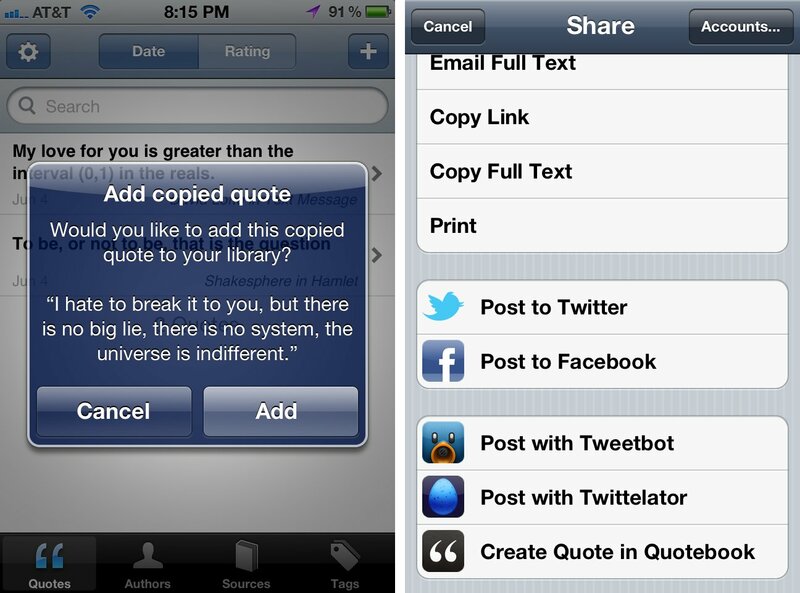 Quotebook is an iPhone and iPad app that lets you keep a library of your favorite quotes and organize them by author, source, rating, and tags. It's a notebook for your quotes. Quotebook comes as a blank canvas. It's not meant to be used as a method of discovering quotes, but for keeping a diary of your favorite quotes, and it includes a few convenient tools to make adding these quotes quickly and easily. The main screen of Quotebook displays the list of all your quotes and can be sorted by date or rating. On the iPhone, you must tap the quote to view it, but the iPad version takes advantage of the extra screen real estate by displaying the list in a column on the left hand side and the main section of the screen features the quote in a a nice big font. The primary method of adding a quote is with the plus sign which can be accessed from any screen. You must then type in the quote, or if you have Siri Dictation, you can just simply say the quote. Personally, I find using dictation to be more natural -- it's a quote, so I want to say it out loud. Often times, you may encounter a quote you want to save while reading something on the internet, a book in iBooks, or even a text message. If you copy a block of text to your clipboard, Quotebook will recognize it and will ask you if you want to add the copied text to your quote book immediately upon launching it. When you accept, it immediately adds the quote without prompting you to add the author, source, or tags, making it extremely quick for those times you just want to be in and out and back to your reading. In addition to this convenient method of adding quotes, it's even easier if you encounter a quote you want to save while reading in Instapaper for iPhone or iPad. To do so, highlight the block of text you wish to save and tap share. Then scroll all the way to the bottom and tap "Create Quote in Quotebook". 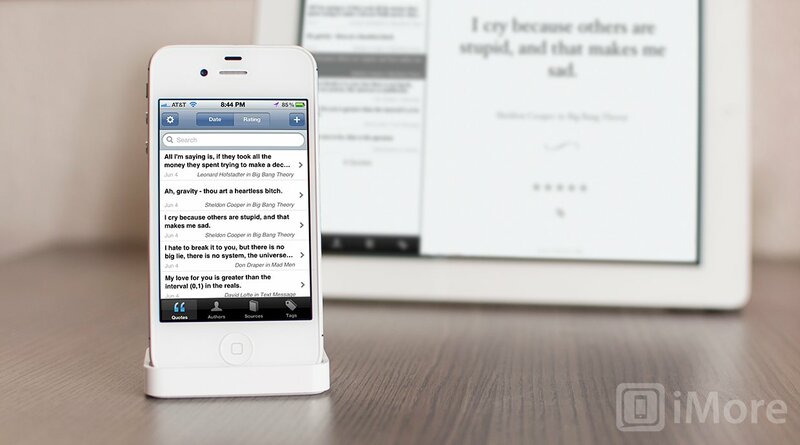 You will then automatically leave Instapaper and be taken into Quotebook where the quote will be instantly added. It will also automatically add the author of the article as the author of the quote and the article's title as the source. As of right now, Instapaper is the only app that offers this integration, but the developers of Quotebook promise there will be more apps soon. If you want to learn more about the authors you've stored in Quotebook, you can easily look up the authors on Wikipedia and find more of their quotes on Wikiquote right from within the app. 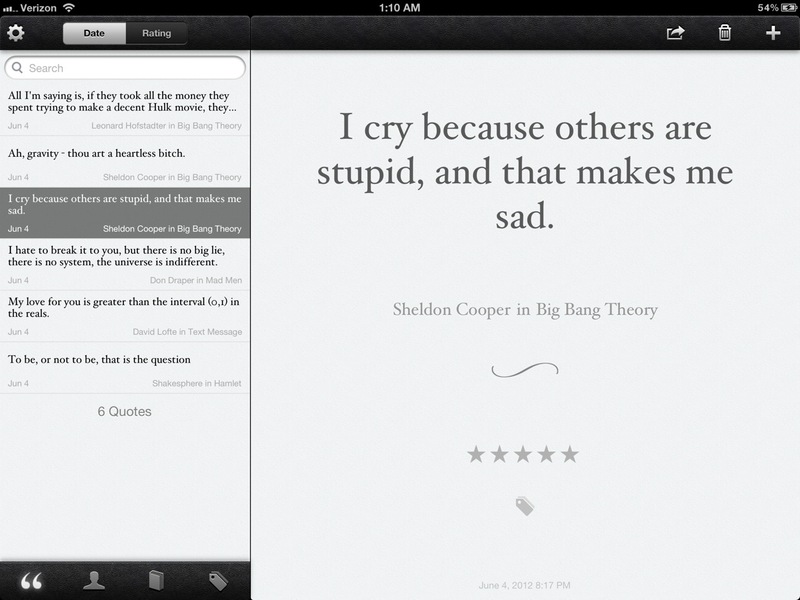 Quotebook also includes support for iCloud which means that all your quotes stay in sync between your iPhone and iPad. 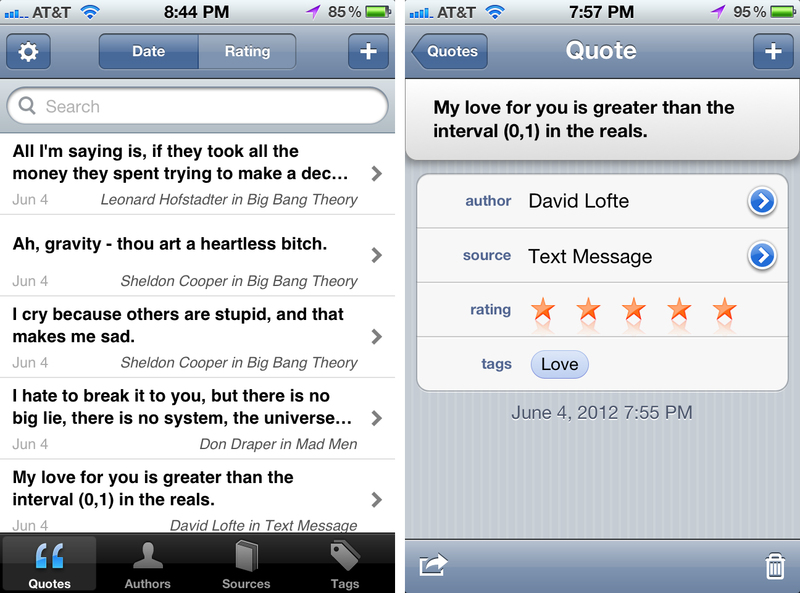 Quotebook is a fantastic little app for storing your favorite quotes. It's super easy to use, offers some great little features to make adding quotes quick, and looks great.